What level should I sign my child up for ? My child… is between the ages of 7 months and 3 years old and I would like to begin introducing them to the water…. ….Enroll in our Aqua Babies class! This is an instructor led class in which the parent gets in the water with the child. We sing, play games, and have fun while getting your child comfortable in the water. My child…cannot comfortably go underwater and hold their breath and cannot front and back float…. …Enroll in our Guppies (level 1) class! This is our introduction to swim lessons class and will work on skills such as blowing bubbles, jumping in and going underwater, back/front float and holding breath underwater. My child can… comfortably hold their breath underwater for 5 seconds, can front and back float, and can jump in and go underwater…. …Enroll in our Goldfish (level 2) class! This class will work on the fundamentals of swimming including front/back streamline, bobbing, kicking with kickboard and retrieving a ring from the bottom of the pool. 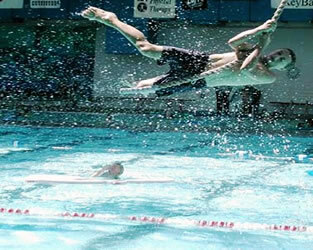 My child can… front/back streamline, jump in and recover to back float and kick with a kick board…. …Enroll in our Piranhas (level 3) class! This class will work on stroke development including front/back streamline with kick, backstroke, side glide and elementary backstroke. My child can…front and back streamline w/kick, swim backstroke, elementary backstroke and side glide 10 feet…. …Enroll in our Seahorses (level 4) class! This class will continue to work on stroke development including treading water, diving off the side, freestyle and side glide into freestyle. My child can…tread water, dive off the side, and swim freestyle, side glide, and backstroke 30 feet… …Enroll in our Sharks (level 5) class! This class will work on stroke technique and endurance. It will focus on freestyle/backstroke endurance and stroke development through drills as well as diving off the starting blocks. Water areobics is a great way to get in shape and stay in-shape, without undue stress on muscles and joints.